The driver has the option to select between four modes: 2×4 / 4×4 fully locked / 4×4 MUD and 4×4 TRAIL. 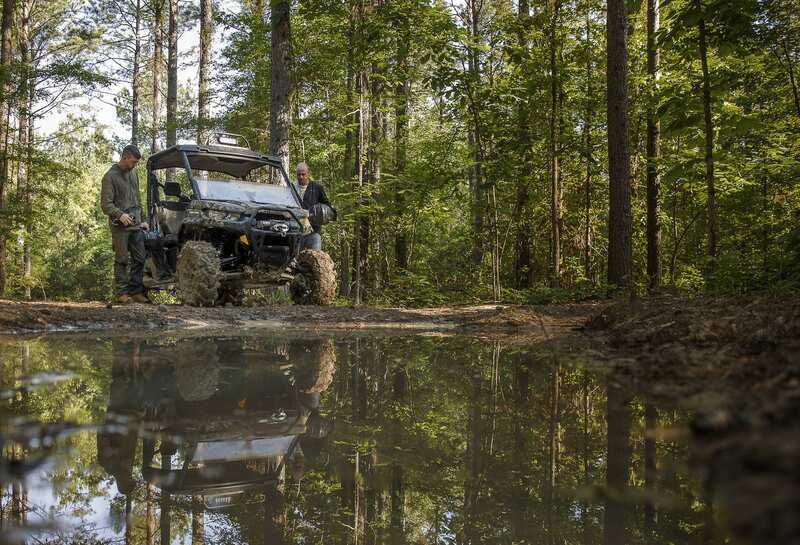 The preset MUD and TRAIL settings are designed to enhance the off-road experience by offering a more customized feel to match to specific terrain, conditions and demands. Our engineering team further enriched the system by including hill descent control, which includes an Electronic Braking System (EBS) at all four wheels, for improved control and traction. The highly durable Cargo box has a 1,000-lbs. / 454 kg (600-lbs. / 272.2 kg in California model) load capacity and has dump assist levers. It also features a versatile configuration that can create a customizable dual-level setup or completely separate compartments. Strategic features include 5-Gal. (18.9 L) pail recesses, integrated anchors on the sidewalls and several tie-down points for added convenience. To fully optimize the sizeable cargo box, consumers can divide up the box using the integrated recesses. The box allows for both 1×3 (inch) and plywood separators and accepts bed extenders for refining the bed’s overall dimensions. and dash space, rather than overall exterior hood size, creates a more spacious interior for the owner. The location of the gauge is strategically positioned in front of the driver to increase the readability of the information provided. The LCD gauge displays key information: speedometer, tachometer, odometer, trip and hour meters, fuel, gear position, seat belt and 4×4 indicator, diagnostics, clock, auto shut off. A 0.7-Gal. 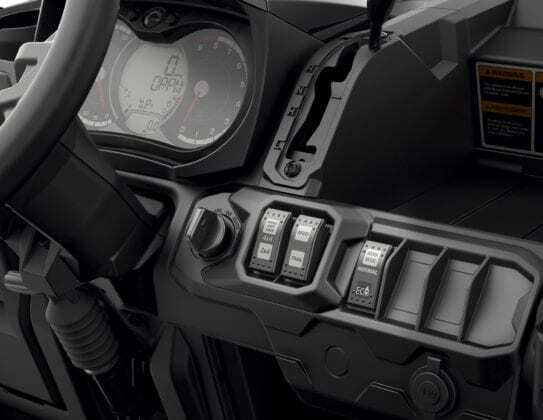 (2.6 L) compartment behind the gauge cluster offers an easy-access storage solution for the driver. 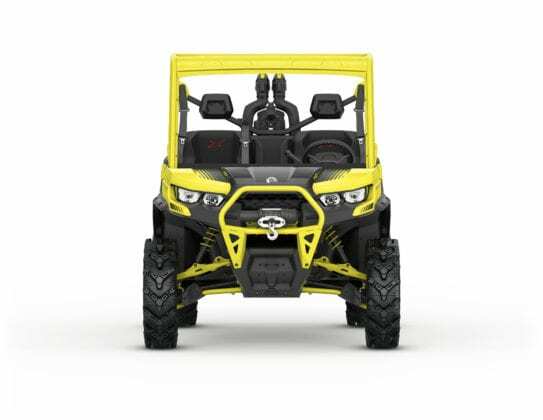 The Can-Am Defender has four, in-cab, easily accessible cup holders. Two are located in the dash area and two additional cup holders are located in the central armrest. Four cup recesses were also incorporated into the cargo box tailgate for ded convenience. 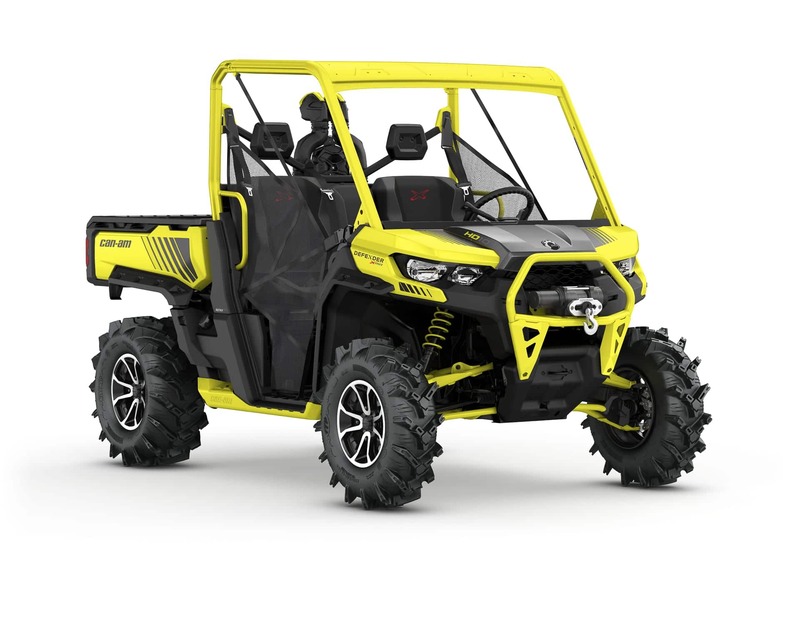 Designed equally with power, comfort and convenience, the 2018 Can-Am Defender XT-P HD10 easily provides on the family’s Tough, Capable and Clever promise, but does so with a distinctively sporty edge, FOX 2.0 Podium shocks and a stimulating Carbon Black & Can-Am Red finish. A durable, powder-coated Can-Am Red heavy-duty front steel bumper enhances the XT-P vehicle’s fascia while also adding protection. 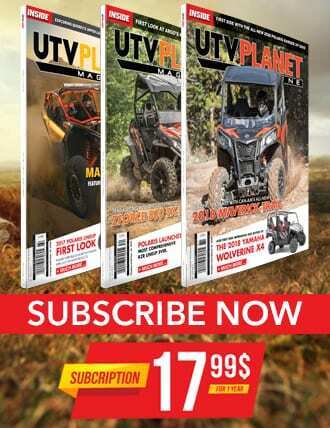 The high-strength full skid plate (center and sides) is made from proven materials and is designed for supreme protection and has the ability to slide over certain obstacles. Heavy-duty, aluminum rock sliders protect the vehicle’s sides and undercarriage from harsh hits from large obstacles and trail debris. They’re finished in Can-Am Red for a distinctive appearance. 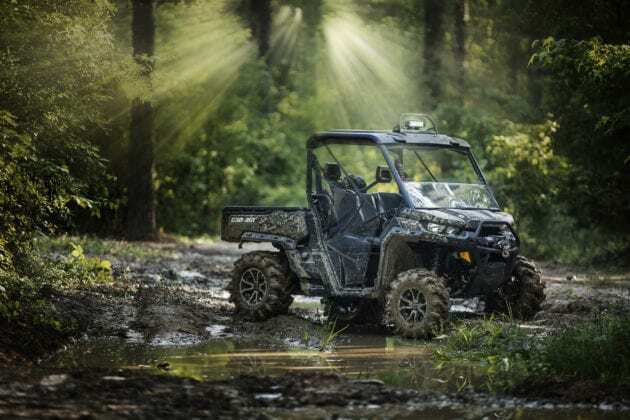 Standard on the Defender XT-P, the refined second-generation DPS system is tuned for utility applications while also offering responsiveness for recreational usage. 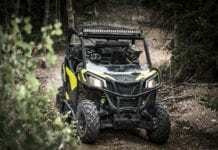 DPS improves steering feel in slow-speed working situations and when the trail turns technical. It also is designed to offer less assistance at high speed and more assistance at low speed. The Visco-Lok Quick Engagement calibration supplies an even quicker engagement of the front differential, which can lock up to 100 percent with no rev or speed limiter. 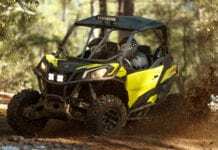 The driver can select between three different driving modes on the Can-Am Defender to adapt to both personal preference and the riding conditions: Eco, Normal and Work. Normal mode has no speed or torque limitations and is optimized for recreational use with no load or a light workload. Work mode is calibrated for working with high loads in a gentle manner, offering a smooth power delivery, still with full power and torque. ECO mode limits both high-range speed and torque to produce moderate driving with regulated-but-smooth acceleration. 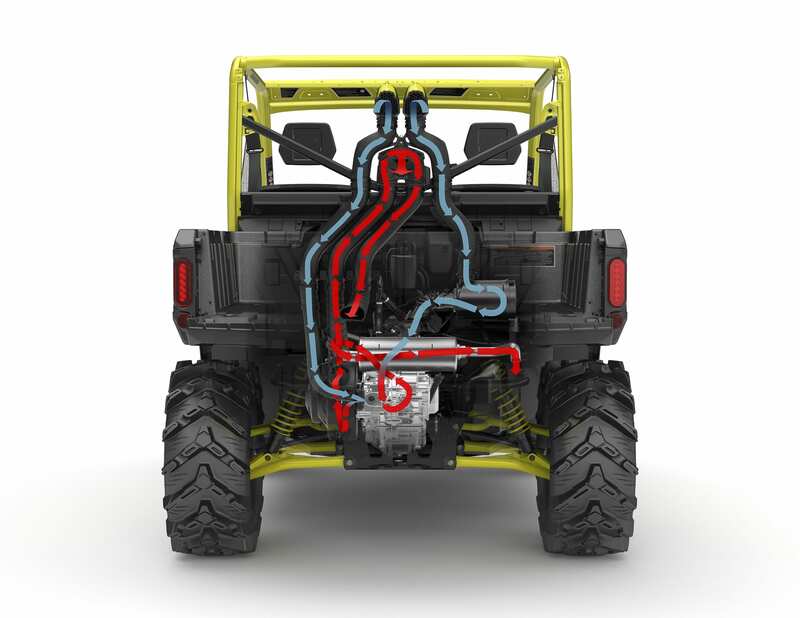 The Defender vehicles have a front double A-Arm suspension system with adjustable FOX 2.0 Podium shocks. The rebuildable FOX 2.0 Podium piggyback shocks are feature adjustments for preload (dual-rate spring) and compression. 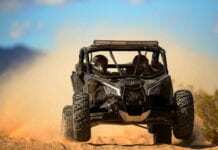 The shocks are designed to be lightweight yet durable to withstand heavy-duty work and sportier applications. 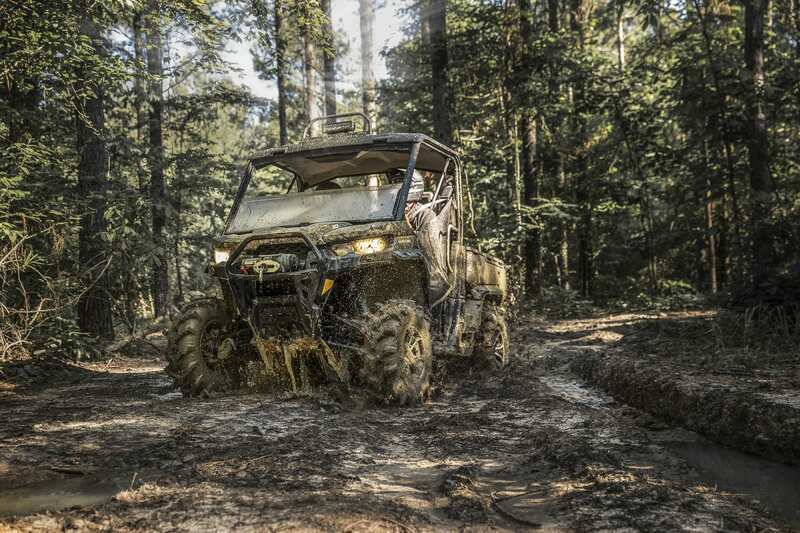 The system is designed to offer predictable handling and control even in difficult terrain. With 10-in. of travel, the ride is smooth in all situations, even when carrying heavy loads. The Torsional Trailing A-arms (TTA) rear suspension, with premium FOX 2.0 Podium piggyback shocks, was designed specifically for both utility and recreational use. The re-buildable piggyback shocks feature adjustments for preload (dual-rate spring), and compression and are designed to be lightweight yet durable to withstand extreme use. The TTA system offers a full 10-in. 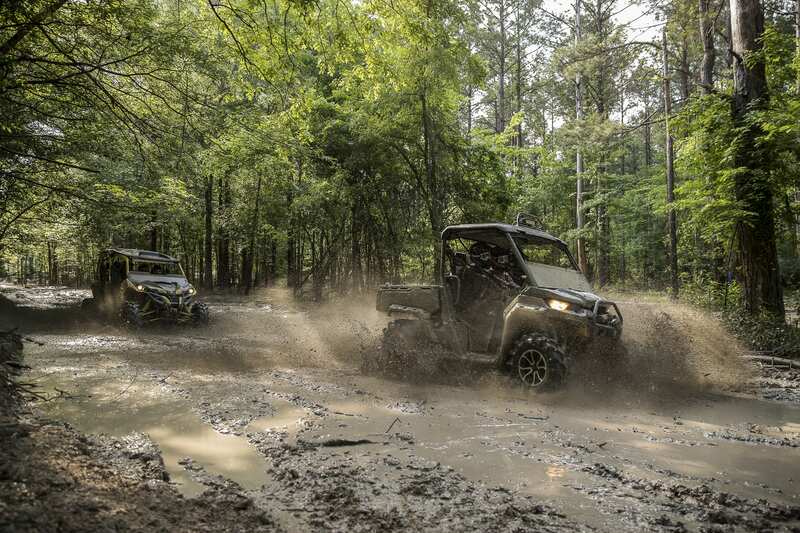 of travel to provide a smooth ride on the trail or in the mud. Its architecture offers optimal comfort and drivability in all conditions, thanks to no camber change. The Defender vehicle’s TTA-HD wears more bushings than some competitive units and is also larger and greaseable on both the chassis and knuckle, resulting in a more durable setup. In addition, the TTA-HD features a wear plate between the suspension and the chassis, preventing direct friction between those two. This all translates to a more controlled wheel movement when driving, and an increased longevity. 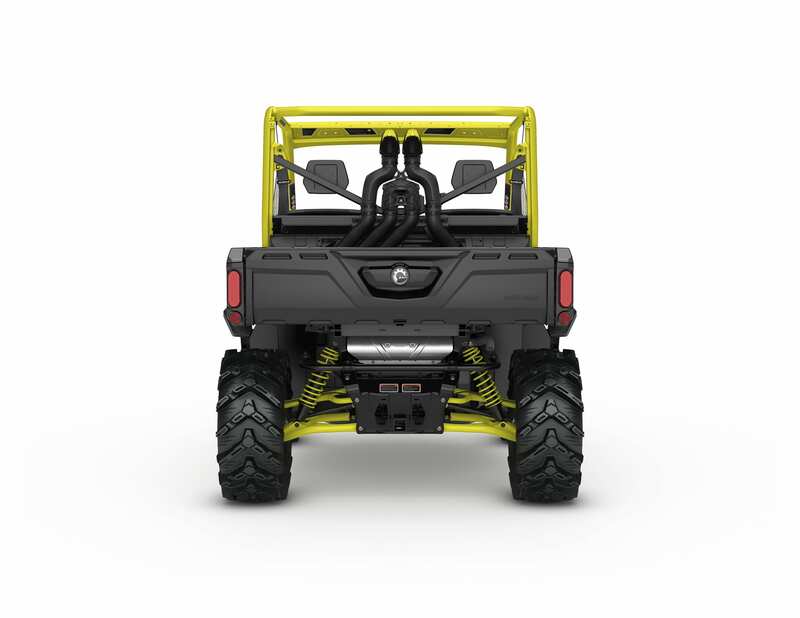 The system also includes a removable external sway bar to enhance traction and the transfer of power to the ground when needed. 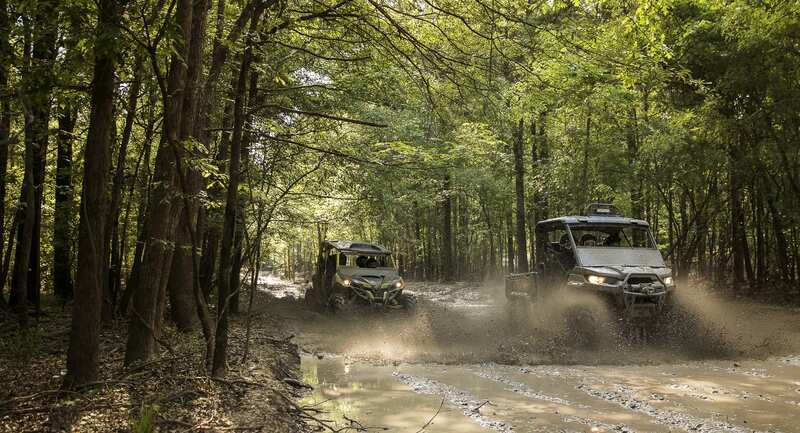 The Defender side-by-side vehicles offer 12-in. (30.5 cm) of ground clearance for maximum performance for conquering difficult terrain or carrying a maximum load. Sturdy, lightweight, 14-in. cast-aluminum wheels with a unique painted black finish come standard. The 27-in. 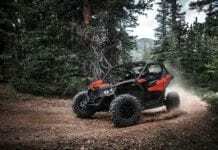 (68.6 cm) Maxxis Bighorn 2.0 tires feature a rugged six-ply radial construction, yet are lightweight to cut down on unsprung weight. 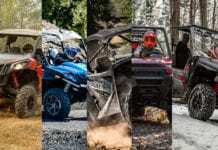 The non-directional tires are very capable of climbing and clawing across tough terrain and also absorb varying surfaces for a smooth ride and provide predictable cornering. 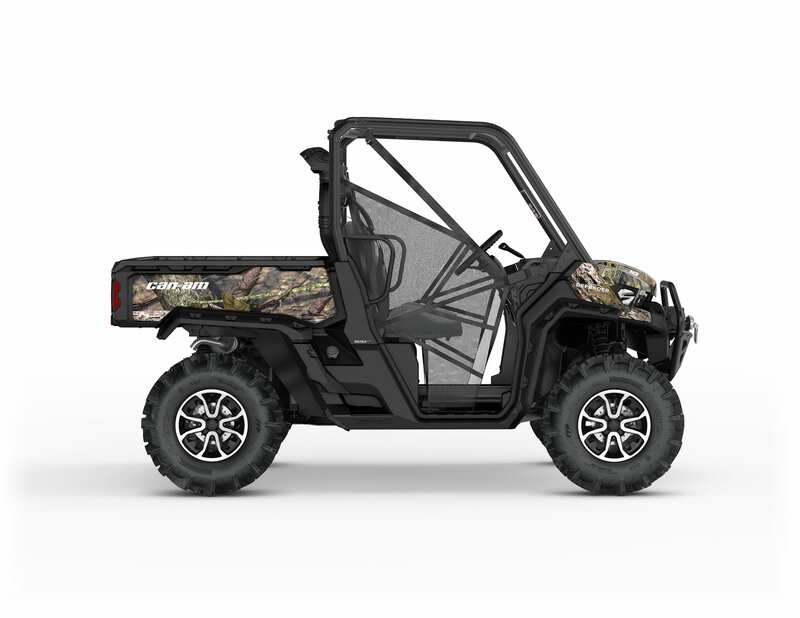 The Defender side-by-side vehicles have a tight 13.1-ft. (399 cm) turning radius to allow for easy maneuverability in restricted work environments, hauling heavy loads and for recreational use. When turning a full circle, the vehicle has a 2-ft. (60.9 cm) shorter diameter than the segment’s top-selling competitor. The highly durable Cargo box has a 600-lbs. 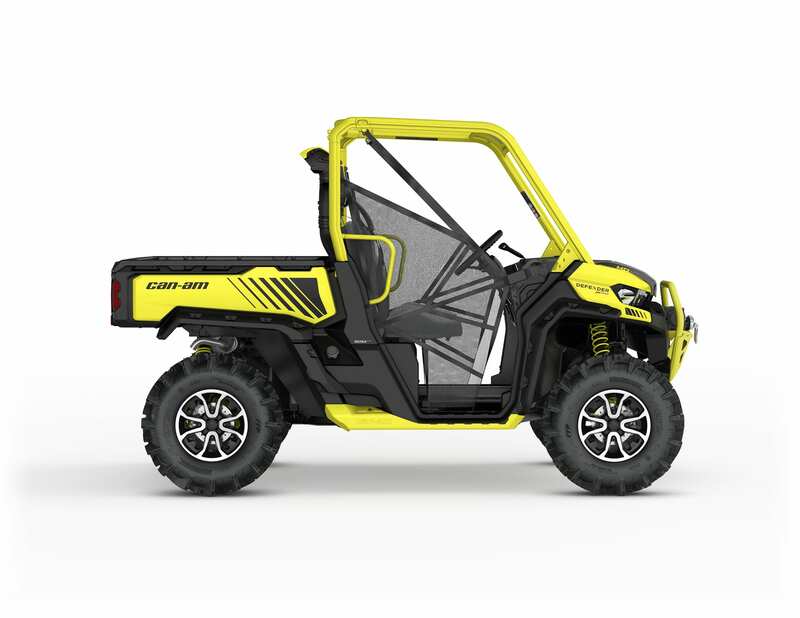 / 272.2 kg load capacity and has dump assist levers. It also features a versatile configuration that can create a customizable dual-level setup or completely separate compartments. Strategic features include 5-Gal. (18.9 L) pail recesses, integrated anchors on the sidewalls and several tie-down points for added convenience. To fully optimize the sizeable cargo box, consumers can divide up the box using the integrated recesses. The box allows for both 1×3 (inch) and plywood separators and accepts bed extenders for refining the bed’s overall dimensions. 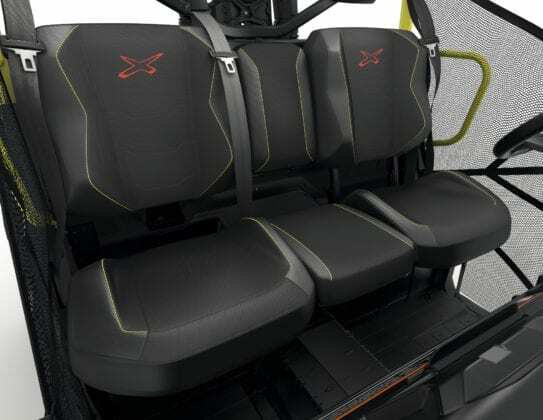 The Defender XT-P HD 10 vehicle has the 40/20/40 bolstered VERSA-PRO Bench Seat, which was inspired by modern pick-up trucks. The bolstering adds additional lateral and side support for both the driver and right hand passenger seats. 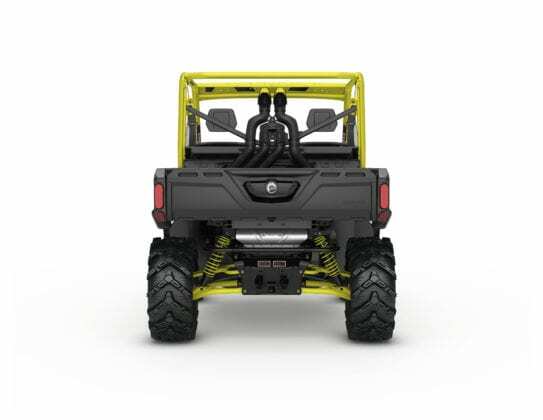 It can comfortably accommodate three adults and features “profiled” corners to improve entrance / exit of the cab as well as a sturdy vinyl cover for improved wear resistance. The passenger seats, complete with integrated hooks on their underside, also can be flipped up to improve onboard storage. Can-Am engineers also added a foldable central console and armrest with two cup holders to allow more space in the cab. The 5.6-Gal. (21 L) enclosed under seat storage beneath the passenger seat offers a large waterproof space for the most precious items, and is easily removable for the user’s convenience. The centrally located convex mirror supplies a wide-angle view of the trail and surroundings behind you. 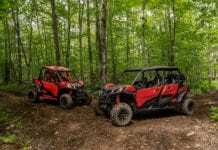 The Defender XT-P HD10 comes in Carbon Black & Can-Am Red.